These Rainbow No Bake Brownies are perfect Vegan and Gluten Free Desserts for getting your chocolate fix any night of the week. 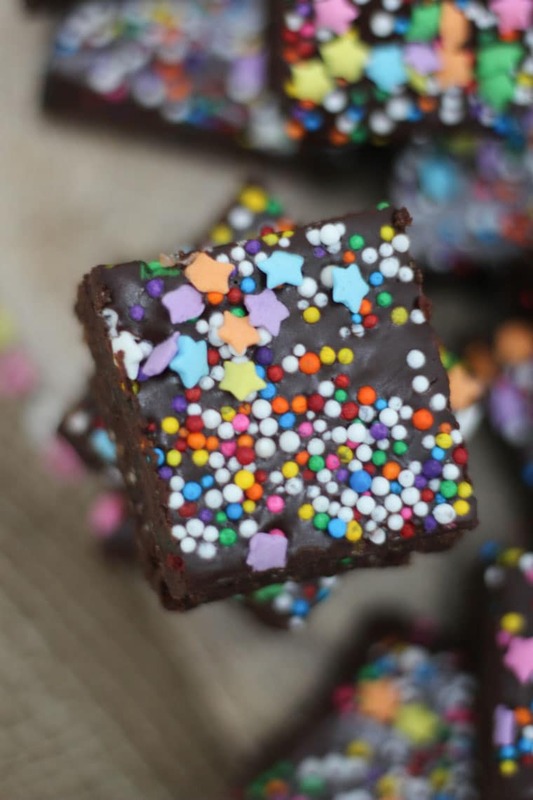 Guys, I can’t tell you how amazing these Rainbow No Bake Brownies are. 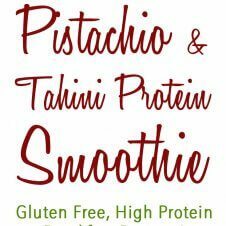 Like, this is a recipe I’m going to make again and again and again, because it’s easy as pie, better for you, and can satisfy the sweet tooth of all of my vegan and gluten free friends. First, we make the brownie base and it’s basically just a combination of sweet dates, almonds and cocoa powder. 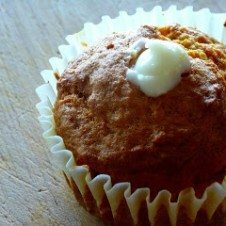 There’s no need to add extra sugar when they taste this good. I mix in a good handful of rainbow sprinkles for good measure before whipping up a simple ganache. The ganache in these Rainbow No Bake Brownies is also easy. I just add dairy free chocolate to heated coconut milk, and drape it over my brownie base. Sprinkle it (generously) with rainbow sprinkles and let the whole thing set until you can’t stand it anymore. Trust me, you’ll be itching for a taste. 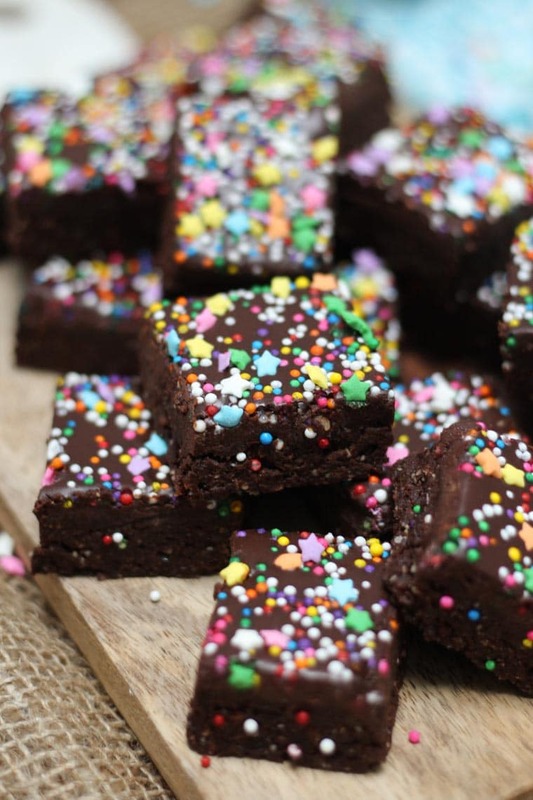 I recommend cutting these Rainbow No Bake Brownies into small squares because a little bit goes a long way. Despite all those healthy ingredients, they’re remarkably rich and satisfying. You can also freeze them so that you have a little something-something to get you through any tough day. Now tell me, what’s do you insist on eating on your birthday? 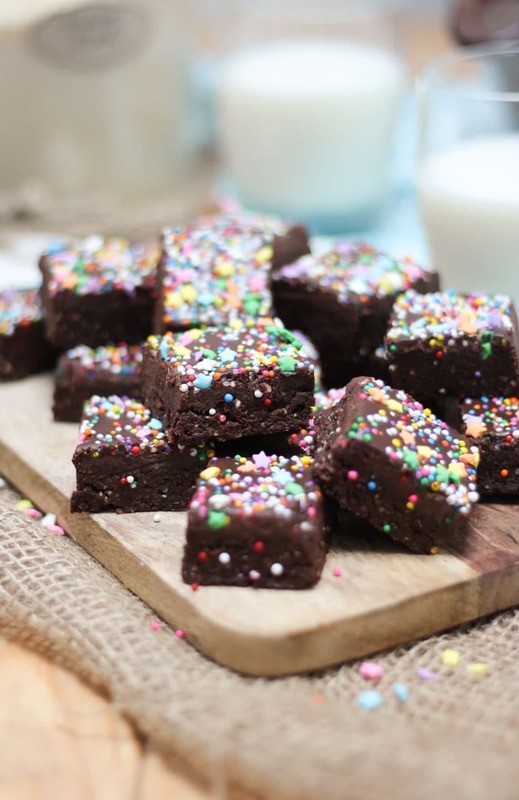 Have you tried making my Rainbow No Bake Brownies? In a food processor, puree the dates until they reach a thick paste. Add in the almond flour, cocoa powder, coconut oil, salt, and vanilla. Process until well combined then mix in the sprinkles. Line a 9" square baking dish with parchment paper and press it firmly into the bottom. Place in the fridge. Meanwhile, heat the coconut milk in a saucepan over medium high until boiling. Remove from the heat and pour over the chocolate. Stir until the chocolate has melted. Remove the brownie base and pour chocolate all over the brownies. Sprinkle liberally with sprinkles. Refrigerate for at least an hour to set. Cut into 16 bars and enjoy! Oh man I could seriously go for a brownie right now. Especially warmed. 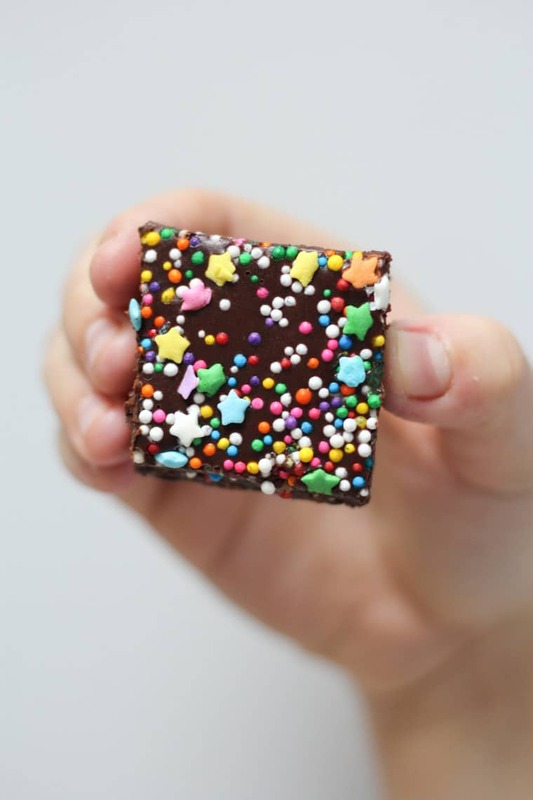 Such a fun brownie! Love that they are no bake and so festive. A must make this season. These look like super cute, fresh Little Debbies! pinning this right now! it really looks very rich and delicious. How can you not have a big smile on your face eating these? Love the sprinkles. Mmmmm!!!! 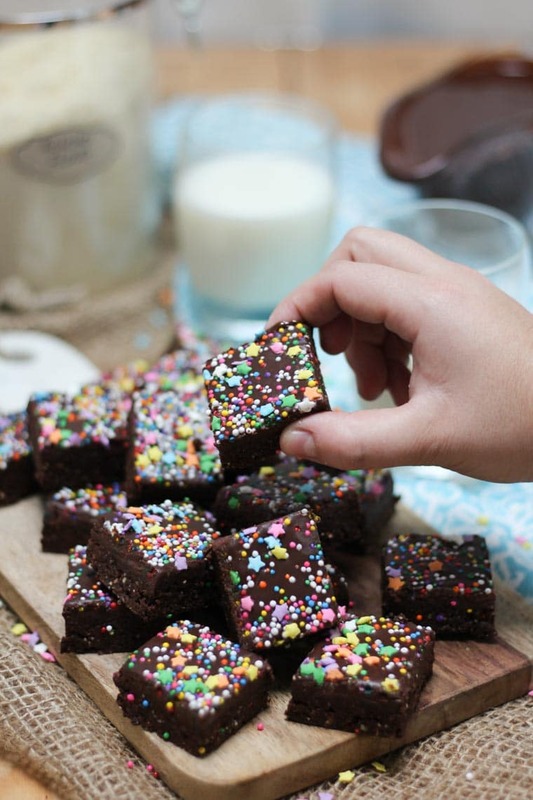 You had me at rainbow brownies! These brownies look super moist! Just love these.